From small mud huts to towering steel skyscrapers, African architecture is a mix of indigenous and foreign, old and new. The continent’s diverse architecture reflects its varied climates and environments as well as the many different cultures and traditions of African peoples. Outside influences have played a major role as well. 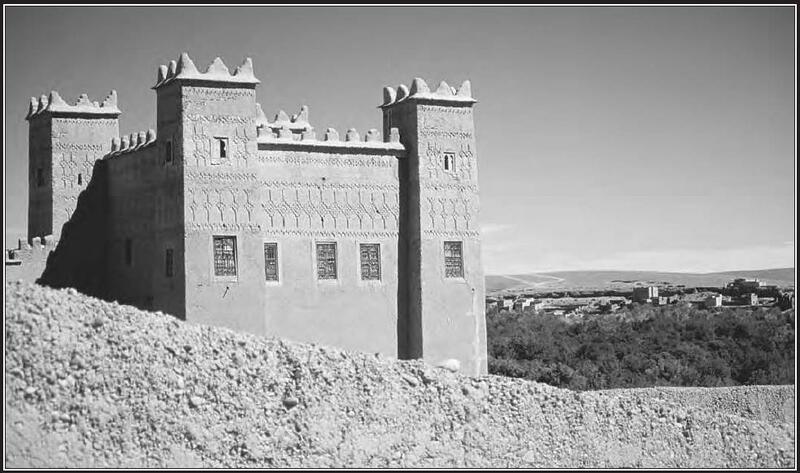 European designs and building methods can be seen in countries throughout the continent, and Islam has shaped much of the architecture of North Africa. Nonetheless, African traditions continue to be the most important factor. 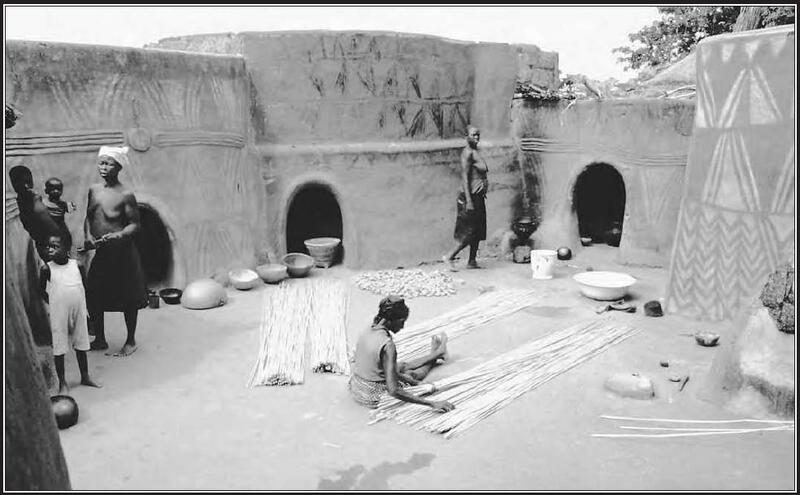 Indigenous architecture in Africa is closely connected to the lives of the people of an area. Their social systems, livelihood, and religion influence the type of structures they build and the way in which they lay out their communities. The climate and natural resources of a region also play a role in determining the forms and materials used in construction. Both culture and natural resources of an area affect the way people create and decorate their architecture. People throughout Africa have developed styles of architecture that are central to the cultures of particular ethnic groups. In many rural societies, especially those based on agriculture, people live in compounds consisting of several separate buildings connected to or surrounded by a wall or fence. Such compounds typically house an extended network of family members. The individual dwellings of mud, wood, and thatch are round in some regions and rectangular in others. Each building in a compound has a specific purpose. There are spaces for cooking, sleeping, storage, worship, domestic animals, and sometimes for burying the dead. The buildings and outer walls of a compound surround a central courtyard, which is usually the main working place for the family. Many African towns and cities are patterned after the basic rural compound. Many cities were originally enclosed by walls made of wood, earth, or stone, depending on the available natural resources. Markets and palaces of rulers surrounded the large central square. In North Africa, towns with narrow twisting streets and tightly clustered homes were often protected by a massive outer wall and defensive fort called a Casbah. In some cultures, belief in a spiritual life after death focused architectural efforts on creating elaborate monuments and tombs. Among the most famous structures on the African continent are the great temples and PYRAMIDS of ancient Egypt. Built for Egyptian rulers believed to be gods, these tombs were constructed of massive stones and designed to last forever. The ancient AKSUM culture in what is now Ethiopia and Eritrea once built monuments on a similar scale, including pillars carved in the shape of multistory buildings that towered over 100 feet high. These remain standing today. In contrast to these monumental structures is the temporary housing of hunting-gathering societies and some pastoralists. Their architecture often consists solely of tents and other shelters that can be assembled and taken apart quickly. Built of various lightweight materials, such as wood, grasses, and hides, these portable structures accommodate the nomadic lifestyle of their inhabitants. The environments found in Africa range from harsh deserts to tropical rain forests to temperate savannas. The architecture of each region is directly related to its environment and the building materials available. In tropical regions of heavy rainfall, people typically build homes with sloping roofs that allow water to run off easily. Numerous openings in exterior and interior walls permit outside air to pass through a building and cool it. Because vegetation is often dense in such regions, common construction materials include wood and plant matter, such as leaves and vines. By contrast, in hot, dry regions where timber is scarce, dried mud or bricks are often used for buildings. Thick walls with few openings help keep out the daytime heat, allowing the interiors to remain relatively cool. In areas that have strong, regular winds from a certain direction, structures are placed to take advantage of the cooling effects of breezes and some walls may be reinforced to withstand storms. The building materials used in traditional architecture depend largely on a region’s resources. In North Africa and along the east African coast, many ancient cities and monuments were made of stone. The Egyptians constructed temples and pyramids of local limestone. The coastal-dwelling Swahili built with blocks of coral. Even today, some settled rural populations in East Africa use stone for houses, grain storage buildings, and the foundations of walls because stone lasts far longer than wood in tropical climates. In the rainforest regions of Africa, people harvest hardwood for walls, ceilings, roofs, and doors. Some tropical hardwoods are brought to savanna areas, where trees and bushes are scarce. Other common rainforest building materials are bamboo and the flexible roots of trees. Palm fronds, grasses, and vines are woven into mats that are used for walls and roofs and for decoration. In many parts of Africa, buildings are made of earth. Some people use mud to form cone-shaped or rectangular bricks that are dried or baked until hard. Others build with balls of wet mud. Clay pots and pottery may be employed as paving tiles, gutters, and wall linings. African builders frequently work with combinations of stone, earth, timber, textiles, and other materials. They top earthen roofs with wooden planks, dry straw, or plant leaves. They reinforce earthen walls and arches with tree roots and bamboo sticks, and they make tents with branches, leather, and textiles. Building in rural Africa has traditionally been a family or even community effort. Many people lend their skills to erect a building. The building process might involve blacksmiths, woodworkers, weavers, and potters. Specific tasks are often assigned according to gender. Usually, men cut and carve wood, mold and shape bricks, and construct the earthen walls of houses. Women may make architectural pottery such as tiles, gutters, and decorative features, carry water to the work site, and apply the finishing coats of plaster or mud on walls, floors, and other surfaces. In Africa’s Islamic cities, however, construction has generally been left to specialized groups of builders and artisans. Deeply respected, these workers have held a high place in society. Many people have also feared them, believing them to have magical powers. Often Islamic political and military leaders designed the cities. They planned city walls, mosques, and palaces based on religious principles and the decorations found in the Qur’an, the holy book of Islam. The construction process in Africa often includes religious rites. Many peoples perform sacrifices and other ceremonies before, during, and on completion of a building project. Such rites are believed to help ensure that the structure will remain strong and stable and that the life of its occupants will be peaceful and prosperous. Some nomadic groups build a house as part of their marriage ceremony. For some African groups, decoration is an important part of a building’s construction. The bricks or stones in a wall may be laid so that they form a particular design. The Rozwi people of southern Africa, for example, built intricately patterned stone walls during the 1600s and 1700s. Some groups arrange straw or other grasses in appealing patterns on roofs; others twist branches and plant materials into decorative features. Designs and colors may be woven into roof and wall mats, such as those made by the Kuba people in the Congo. Decorative elements may also be added to structures after they are built. The most commonly applied surface decoration—used primarily on stone or earthen walls—is dried mud. The mud may be colored with vegetable dyes, carved in bas-relief, or embedded with pieces of pottery, seashells, or other materials. Architectural decoration is found most frequently on doorways and entrances, around window openings, on exterior walls and interior courtyards, and on the tops of roofs. It may also be used to mark a significant place, such as a hearth or storeroom, or an important building in the community. The patterns of surface design vary according to ethnic group, religion, and building function. The ancient Egyptians added paintings and carvings to their architecture to tell stories and communicate religious messages. In Islamic communities, buildings are usually adorned with geometric and scriptlike designs because the Muslim religion forbids making pictures of people and animals. In many cultures, certain colors or patterns may hold special symbolic meaning. The HAUSA of northern Nigeria decorate the outside of their homes with bas-relief or painted designs, sometimes including pictures of bicycles and cars to represent high social standing. The NDEBELE of South Africa decorate homes, churches, and other buildings with bold and colorful geometric patterns. Travelers from Europe and Asia have long influenced Africa’s architecture. The ancient Mediterranean civilizations of Phoenicia, Greece, and Rome built great cities in North Africa. Later Arabs introduced Islamic architecture to the people of Africa’s northern coast. Christianity played a lesser role in the continent’s early architecture, although it inspired some unique early churches in northeastern Africa. Settlers and invaders from the around the Mediterranean—particularly the ancient Greeks and Romans—brought their own styles of architecture to Africa. Around 800 B.C., the Phoenicians, a seafaring people from the eastern Mediterranean, built the thriving city of CARTHAGE in what is now Tunisia. The Romans destroyed the original buildings around 150 B.C. Later they rebuilt the city and made it the capital of their African province. The new city boasted an amphitheater, a forum, and miles of aqueducts that carried water to luxurious baths like those in Rome. After Carthage declined, later generations of Tunisian builders reused its stones in surrounding cities. The Greeks constructed another of North Africa’s great cities, ALEXANDRIA, in ancient Egypt. Founded in 332 B.C. by Alexander the Great, the city included palaces, parks, and temples in the Greek style. Among its most famous buildings were a vast library and a museum, which served as an institute for higher learning. A towering lighthouse with a fire at its peak guided ships into Alexandria’s harbor and was considered one of the wonders of the ancient world. By the 900s, Arabs were spreading Islamic culture and architecture along the coasts of northern and eastern Africa. Mosques are among the most striking forms of Islamic architecture in Africa. They are often decorated with elaborately carved stucco and wood and with detailed tile and glass mosaics. Built around a courtyard and a prayer hall, many mosques feature horseshoe-shaped archways, multiple domes, arched ceilings, and up to six minarets—tall, thin spires from which Muslims are called to prayer. North African mosques are particularly ornate. Although mosques in Africa are distinctly Islamic in function and decoration, they include elements of indigenous architecture. In Cairo, mosque builders used an ancient Egyptian technique to carve finely detailed decorations directly into the surface of stone. In East Africa, Swahili palaces and mosques are constructed of coral blocks. Several early West African mosques, including one in TIMBUKTU in Mali, are made in the local fashion using mud strengthened with numerous wooden poles that poke out from the exterior walls. The ends of the poles serve as a scaffold for workers to climb up and repair the mud walls when they are damaged by heavy downpours during the rainy season. Although Christianity spread to Africa in the first centuries A.D., it had little effect on African architecture until the late 1800s when European-style churches were introduced. One exception is the churches built in what is now Ethiopia and Eritrea. In the 1200s indigenous Christians of that area carved massive churches out of solid rock. The style of these churches owed something to the carved monuments of the earlier Aksum culture. Another uniquely African style of Christian architecture developed in the Gondar and Lake Tana regions of Ethiopia in the late 1500s. Churches built in this area were round and were surrounded by long walkways covered with arches and walls topped by towers. When Europeans began to colonize Africa in the 1500s, a new style of African architecture was born—colonial architecture. From government and commercial buildings to the houses of wealthy Africans, colonial architecture reflected the political and economic relations between Europeans and Africans. It was primarily an expression of European power and authority. Although many European nations played a role in colonizing Africa, no clear distinction can be seen in the architecture of their colonies. Rather, these colonial powers produced a common style with variations that reflected local African building traditions, climate and natural resources, and political developments. 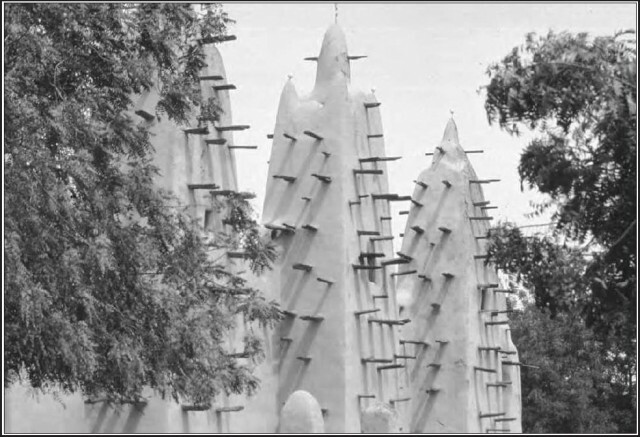 Some of the earliest colonial architecture appeared in West Africa. From the 1500s to the 1800s “Portuguese-style” houses were constructed along the West African coast. Rectangular in shape, these buildings had a whitewashed exterior and a veranda—a long, roofed porch. In Saint-Louis (in present-day Senegal), the first colonial capital of French West Africa, merchants built houses with interior courtyards and second-floor porches. During the mid-1800s, European missionaries in West Africa constructed two-story buildings with a porch and covered passageway. During the late 1800s, Brazil, a former colony of Portugal, lent its own flavor to colonial architecture in West Africa. Wealthy middle-class residents of African and Brazilian ancestry built lavish dwellings with the ground floor devoted to business and the upper stories for living quarters. They featured highly decorated facades—building fronts—that proclaimed the wealth of their owners. The Dutch and British had an influence on the colonial architecture of South and East Africa. Dutch colonial houses combined thatched, or straw-covered, roofs and white plastered walls with ornate gables. When the British took over the region in the early 1800s, they replaced these simple houses with a grander style of architecture that featured fancy facades. British colonial-style buildings were one or two stories tall with encircling porches. Some were made of prefabricated materials, and most had roofs covered with sheets of metal. By the late 1800s a formal colonial style had developed in Africa. This style was also found in India, Southeast Asia, the West Indies, and other European colonial areas. The typical residential structure was a two-story building raised on pillars. Doors and windows were aligned to take full advantage of air currents, and a veranda surrounded the building on both levels. The veranda existed in West Africa before the arrival of Europeans, who readily adopted it for their own use because it created a shaded living area open to cooling breezes. Government and administrative buildings, located in the capital cities of African colonies, had an important role in colonial architecture. Built to reflect colonial power and prestige, such buildings were large and impressive. They included various durable materials such as stone and hardwoods that were meant to last a long time. Since the colonial period, foreign design and technology have continued to influence architecture in Africa. Colonial policies, urban growth, migration, and Western technology encouraged the introduction of new building materials, systems of construction, and building functions. In many rural areas, however, the basic forms of traditional architecture have remained relatively unchanged. But now instead of using grasses and palm leaves for roofing, African builders often replace these natural materials with sheets of iron or aluminum. Instead of sun-dried brick, they may use concrete blocks.